Now THIS is my favorite! 1. In a medium bowl, whisk together the flour and salt. 2. Cut in the shortening until it’s in lumps the size of small peas. 3. Dice the butter into 1/2″ pieces, and cut into the mixture until you have flakes. 4. Add the water, two tablespoons at a time, mixing with a fork as you sprinkle the water into the dough. 5. When the dough is moist enough to hold together when you squeeze it but not too wet, transfer it to a piece of wax or parchment paper. 6. Fold the dough over on itself three or four times to bring it together, then divide it in half and pat it into two disks 3/4″ thick. 7. Roll the disk on its edge, like a wheel, to smooth out the edges. This step will ensure your dough will roll out evenly, without a lot of cracks and splits at the edges later. Wrap in plastic and refrigerate for 30 minutes before rolling. 8. Lightly grease a 9-inch pie pan that’s at least 2 inches deep. This will make serving the pie easier after it’s baked. 9. In a small bowl, add the sugar, cornstarch, salt and cinnamon to the blueberries and gently mix. 10. Roll out half of the pastry to a 13″ circle. Transfer it to the prepared pie pan, and trim the edges so they overlap the rim of the pan by an inch all the way around. 11. Spoon the filling into the pan. Dot the top with the the diced tablespoon of butter. 12. Roll out the remaining pastry to an 11″ circle. Cut decorative vent holes, if desired. Carefully place the pastry over the pie filling. 13. Preheat the oven to 425°F. 14. Roll the overhanging bottom crust up and over the top crust, pinching to seal the two. 15. Flute the edges of the pie. 16. Place the pie on a baking sheet. Bake the pie for 45 minutes at 425°F until you see the filling bubbling inside the pie and the crust is golden in color. 17. When the pie is done, remove it from the oven and cool it completely before slicing about 1 hour. 18. Serve with ice cream. 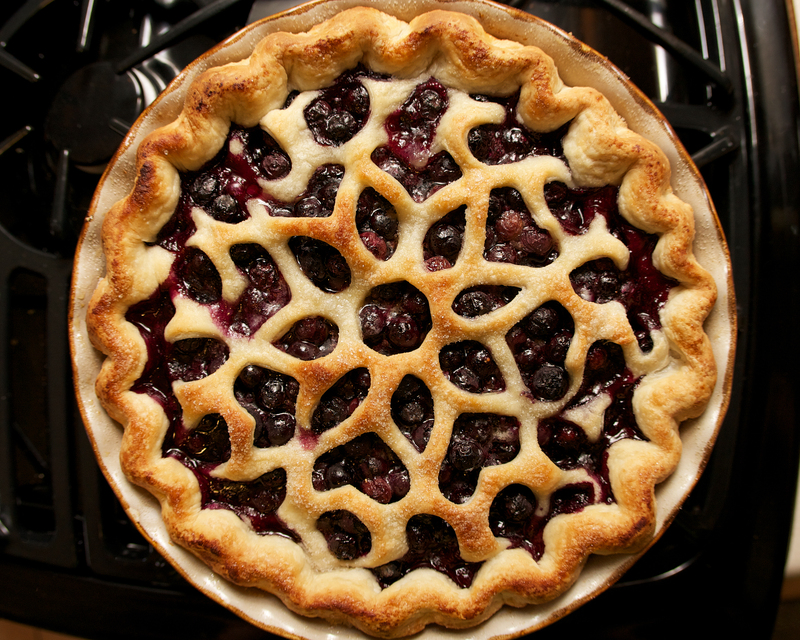 This entry was posted in Uncategorized and tagged blueberry pie, pie. Bookmark the permalink.